The Unitarian Church in Summit, New Jersey is a welcoming fellowship with more than a century of rich tradition. 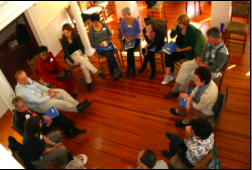 When a committee was formed to integrate spirituality and community building into the congregation’s long-term strategic plan, they looked to the team at Executive Soul for guidance. Executive Soul consultants helped the congregation create a plan that would grow the congregation while staying true to long-standing moral, intellectual, and spiritual principles. This nine-month process included the formation of discovery groups that met and discussed vision, and a series of meetings and retreats with the planning team and the congregation as a whole. The congregation created a mission and vision statement and is in the process of working with its small groups and committees to expound on specific action recommendations. The congregation also recently purchased a new parcel of land adjoining the church’s property. The strategic planning committee and the congregation are working well together and look forward to great things in the future.